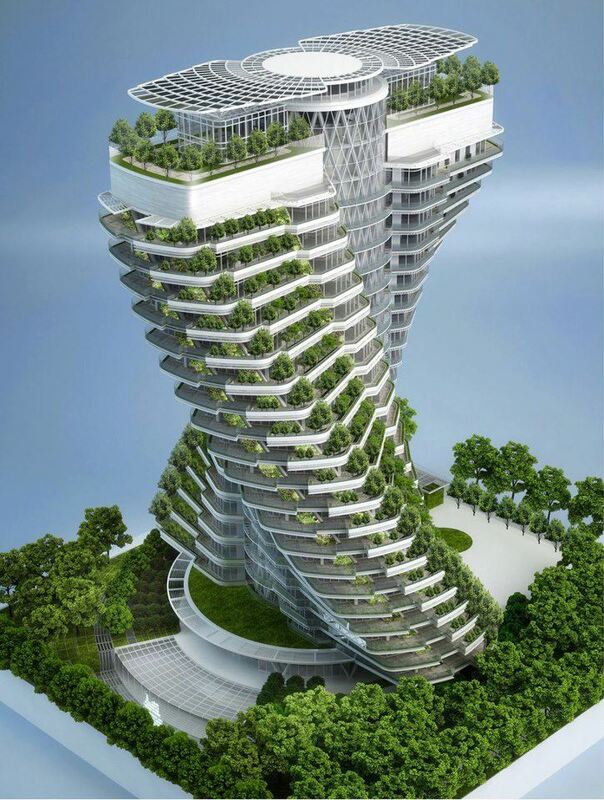 The Agora Tower by Vincent Callebaut Architectures, known for their distinct eco-vision, designed this tower to be placed on the biggest, not to mention last, parcel of land for residential use in Taipei City, Taiwan. The twisting foliage-filled tower allows for a high-density space to exist that will also limit the ecologic footprint of the inhabitants. The aim of this building is to forge a symbiotic relationship between the urban dweller and nature. The helicoidal towers appropriate their form from the structure of DNA, conceptually speaking to the building blocks of life, as well as dynamism and twinning. In a single level, four types of housing units are present, and in the structure as a whole there are 40 luxurious apartments as well as facilities. The act of twisting the form creates the optimization for open-air hanging gardens consisting of tall planted balconies of suspended orchards, organic vegetable gardens and medicinal greenery. Multiplying the transversal views of the overall east-west rhomboidal pyramid is produced by angling the apartments also allowing them to have exceptional views of the city.